£Sorry, this accordion is now sold. 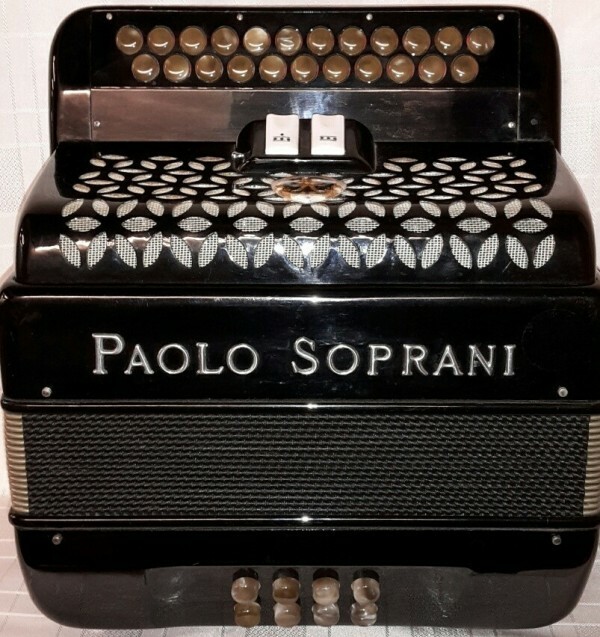 A black badge Paolo Soprani Elite 1 made in Italy c.1970s. Originally supplied by Clinkscale Accordions Melrose. & in nice condition for it’s age with no major wear & tear on the bodywork. Supplies with original shaped case. Two treble couplers with traditional musette tuning. This accordion has been checked over & all the reeds are playing well & the tuning is excellent. To buy this Paolo Soprani Elite 1 D/G or get more info please call our Rochdale shop on 01706 658283. This Paolo Soprani Elite 1 D/G comes complete with a carrying case, padded shoulder straps and a 1 year component parts guarantee. Don’t forget, free delivery of this Paolo Soprani Elite 1 D/G to most parts of mainland UK is included!